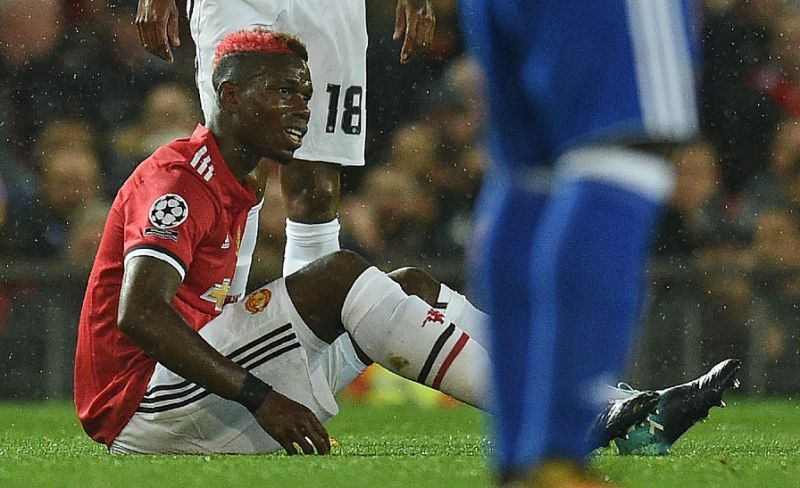 Manchester United's Paul Pogba lasted just 18 minutes of Tuesday's Champions League group game against Basel before being forced off by an apparent left hamstring injury. London - Paul Pogba could be out of action for a "few weeks" after suffering a suspected hamstring injury that took the shine off Manchester United's successful return to the Champions League, manager Jose Mourinho said. But, making his debut as United captain, Pogba lasted just 18 minutes of the Group A game before being forced off by an apparent left hamstring injury, with Fellaini taking his place. The 24-year-old French midfielder reportedly left Old Trafford on crutches. Pogba's injury will also concern France, who are hoping he is fit in time to play in the crucial World Cup qualifier against Bulgaria on October 7. Mourinho said he had midfield options for the weekend's Premier League clash with Everton, including Ander Herrera, Michael Carrick, Fellaini and Nemanja Matic. Rashford, who made his Champions League debut on Tuesday, said Pogba's loss was a big blow. "Paul's going to be a massive miss and hopefully we can get him back fit as soon as possible," said Rashford. "We have to play every game to win. If we want to be champions, then we have to win (those) types of games (like Sunday's). It's going to be difficult. Everton are a really strong team." The teenager said United's strong squad would help them cope with the loss of Pogba. Rashford has looked bright in the early weeks of the campaign but, like Anthony Martial, has been unable to nail down a starting berth due to United's impressive attacking options. The teenager believes United's embarrassment of riches is helping rather than hindering his and Martial's development. "It's difficult when you're in and out of the team but we have to find the positives out of it and I think we have both done that," the England international said. "I think the competition is always positive competition because we're improving each other every day when we're in training and in the games we're pushing each other more and more." Paul Pogba could be out of action for a "few weeks" after suffering a suspected hamstring injury that took the shine off Manchester United's successful return to the Champions League, manager Jose Mourinho said.